It takes passion, drive, and the desire to help other people to motivate someone to go into business. What may start as learning to take care of one’s own property turns into a hobby and can quickly turn into the realization they have a natural ability that can be offered to the world. Rick Lange started Graphic Accents 25 years ago in a van and with a small vinyl plotter in his home installing pinstriping, small vinyl graphics, and small six-inch strips of paint protection film on the leading edge of the car hoods. A few years later found him moving to a storefront location and eventually to where this local vehicle wrap shop is presently located — a 5,000-square foot building with four employees and multiple large format printers that produce full custom vehicle wraps. Whether businesses in Cuyahoga Falls, Ohio, want to attract new customers with food truck or tow truck wraps or someone in Green, Ohio, with a Porsche wants to protect the paint job with a clear car wrap to boost their car’s future trade-in value, Graphic Accents excels at vehicle paint protection, truck graphics, and cost-effective advertising with the best vehicle wraps from Massillon, Ohio, to Independence, Ohio. Serving car enthusiasts since 1993, Graphic Accents has evolved from a one-man outfit offering a pinstriping out of a van to providing services that can help any business from Massillon to Independence grow with cost-effective advertising. A study conducted by the American Trucking Association found that custom vehicle wraps can generate between 30,000 and 70,000 daily impressions from passersby, and 96% of respondents said fleet advertising had more impact on them than billboards. Mobile advertising delivers 15 times greater name recognition than other types of advertising, in addition to offering the lowest cost-per-thousand impressions (CPM) of any major advertising medium — with the highest average 30-second prime time TV spot at $17.78 per CPM and truck graphics at $.77 per CPM. 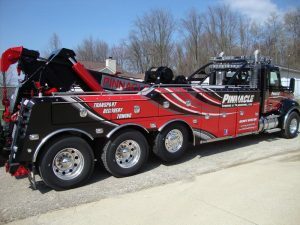 Whether a food truck owner wants to attract new customers, or a tow truck company needs wraps for their heavy-duty fleet, Graphic Accents designs and installs the best vehicle wraps. They also offer a complete line of marketing materials, such as logo design, signs, banners, tri-fold fliers, in-store graphics, window murals, and so much more. With the capabilities of a large facility and machines that can produce customized vehicle paint protection film, this local vehicle wrap shop has come a long way. Passion with a vision has earned Graphic Accents the ability to help people from Green to Cuyahoga Falls to not only personalize their car and protect the leading edges of car hoods, but to also boost its trade-in value with full clear car wraps, or clear auto bras. Their technologically advanced design team uses the industry’s best products for the ultimate in vehicle paint protection from bugs, dirt, scratches, nicks, road salt, sand, and other debris. It will cause no harm to the OEM paint job when removed in the future. The custom cut genuine 3M Scotchgard Paint Protection film stays clear and is virtually invisible, all while being backed by a 10-year guarantee. Events lead people to figure out where their passions truly lie, and Rick Lange was working for another company over 25 years ago when he realized that he had an artistic talent and a desire put a smile on people’s faces. 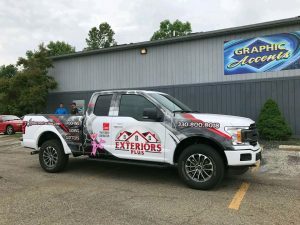 The result was Graphic Accents, and businesses from Massillon, Ohio, to Cuyahoga Falls, Ohio, have been highly satisfied with the results of the cost-effective advertising and impressive truck graphics that has attracted new customers. Additionally, drivers will love the fact that this local vehicle wrap shop offers genuine 3M vehicle paint protection film, or clear car wraps, to block road debris from damaging the paint, ultimately boosting their car’s trade-in value. Whether a driver in Independence, Ohio, would like to protect her BMW 5-Series Convertible or a food or tow truck company in Green, Ohio, would like their company’s design displayed for every potential customer to view, Graphic Accents offers the best custom vehicle wraps with impeccable service! This entry was posted in Advertising/Marketing, Automobile, Business to Business, Graphic Design, Marketing, Paint Protection/Vehicle Wraps, Signs, Signs & Banners, Vehicle Wraps & Graphics, Vehicle Wraps/Graphics, Window Graphics & Lettering and tagged attract new customers Cuyahoga Falls Green Massillon Independence Ohio, best vehicle wraps Cuyahoga Falls Green Massillon Independence Ohio, boost car trade-in value Cuyahoga Falls Green Massillon Independence Ohio, clear car wraps Cuyahoga Falls Green Massillon Independence Ohio, cost-effective advertising Cuyahoga Falls Green Massillon Independence Ohio, custom vehicle wraps Cuyahoga Falls Green Massillon Independence Ohio, food truck wraps Cuyahoga Falls Green Massillon Independence Ohio, Graphic Accents, local vehicle wrap shop Cuyahoga Falls Green Massillon Independence Ohio, paint protection film Cuyahoga Falls Green Massillon Independence Ohio, tow truck wraps Cuyahoga Falls Green Massillon Independence Ohio, truck graphics Cuyahoga Falls Green Massillon Independence Ohio, vehicle paint protection Cuyahoga Falls Green Massillon Independence Ohio by admin. Bookmark the permalink.